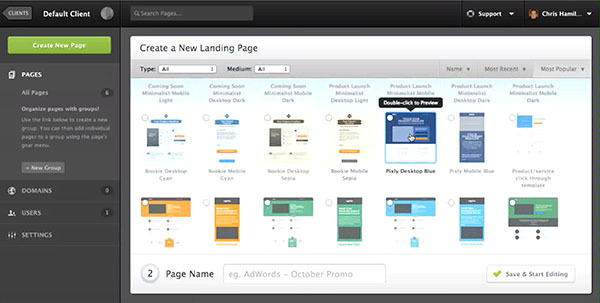 Landing pages are essential to both the marketing and sales process. To quote the esteemed Landing Page Course school of thought, here’s the NSAMCWADLP principle: “Never Start A Marketing Campaign Without A Dedicated Landing Page.” Point taken. Landing pages are hugely important for inbound traffic, customer engagement, and ultimately your goal transaction. Landing pages can play a very powerful role in optimizing all of these things. Note that there are two types of landing pages: lead generating and transactional. Lead generation is for capturing emails and other info essential to your marketing and conversion funnel. Transactional is about getting the consumer to buy your product; you want to be one click away from your shopping cart. 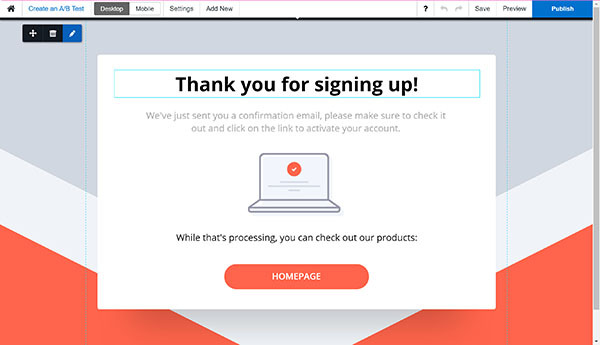 We’ve been researching landing page creators, and one thing that is clear to us is that, if you blur your eyes, they all look a lot alike when it comes to feature sets. But pay attention to the details:. They all offer a decent number of templates - 100 or more. But some companies offer mostly free templates, whereas others have a marketplace of templates that must be purchased a la carte. Most offer a pretty palatable entry level price point around $50, but you’ll want to watch what those entry level tiers cover - some allow for unlimited traffic and others force you to move to the next tier based on traffic. Pricing tiers were pretty clearly outlined with detailed feature sets in nearly all of the landing page options we explored. We found the pretty straightforward and a good reference for the customer. The look and feel of these software vary from complex with full sets of customizable features to barebones templates. Most offer chat support which is important for the teams that are newer to landing pages. Note that it’s often not available at every price point. There are many factors to think about when you are creating landing pages, such as how much marketing expertise you need to be successful with the platform and, similarly, whether there’s any technical complexity that might require help from a developer. Also consider price, template diversity, and its scope of integrations (ex. email marketing tools, CRMs, etc). The landing page tools below have emerged as our founder favorites from hundreds of Stacklist interviews. These tried and tested tools have produced results for our founders, and we think they will for you too. HubSpot is used for a lot of things, like a lot, a lot. One of their undervalued tools is their landing pages! There are a few free (barebones) templates, but their template marketplace, where you could purchase them, is much more diverse, with a huge number of options. Some cost as little as $10 others go for over $100. 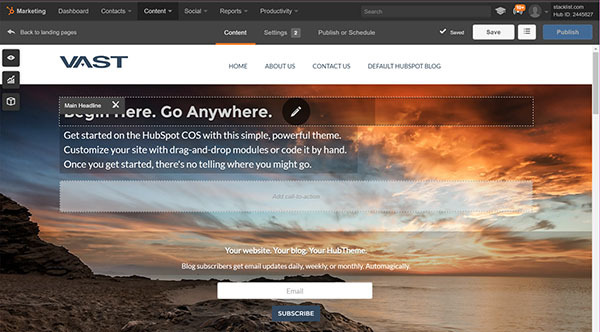 HubSpot is probably a good choice for startups that are already using HubSpot for other tasks, such as CRM. Centralizing your inbound marketing, having all your customer facing material coming from one system, and getting really good at one, all-encompassing marketing can be very advantageous. What did we think of the platform from the user perspective? The editing UX could have been more straightforward, but overall it was not too complex to operate. One thing that we did love was how easy HubSpot makes it to get a quick view of important analytics. HubSpot’s neatest feature is the user friendly analytics it provides. It shows views, submissions, conversation %, and new contacts. This allows you to know in real time how well your landing pages are working. Pricing: The first tier of access to HubSpot is $200. This gets you access to the full HubSpot suite of products - unfortunately, you cannot buy HubSpot landing pages a la carte. The pricing can easily go up to about $3,000 and beyond. Templates vary in cost and the basic plan begins at $200/month, but more typically it will cost around $3,000/year. *This If your team, like more than 10% of Stacklist startups, loves HubSpot, these costs might be justifiable for the breadth of products - but it’s a high price for just landing pages. Instapage is a great option for startups. It is especially useful for those with limited landing page experience, but who know how powerful landing pages can be. Instapage is in many ways an eaiser-to-use version of Unbounce. Instapage’s designer feature has fewer tools and is less complicated. It has the cleanest interface compared to other landing page makers. Instapage’s most attractive feature is its advertised average conversion rate: 25%. They promise results. Their templates also offer a wider variety than Unbounce does and are extremely simple to use. Instapage offers a similiar number of templates to Unbounce - approximately 100. But you can filter by 6 types of pages, such as “click through” or “lead gen.” These are much simpler than Unbounce’s filters and emphasize that Instapage is built off the notion of simplicity and is as easy landing pages get. Pricing: All of Instapage’s pricing options offer unlimited visitors, a big perk. The professional package, which costs $55/month when billed annually, comes with unlimited A/B testing variants and custom code editing. 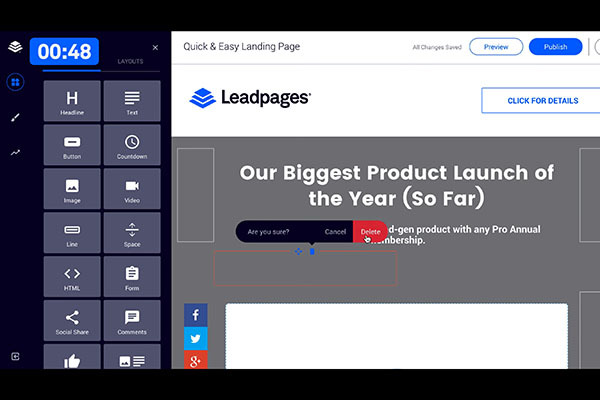 LeadPages is a smaller platform, and its size comes with limitations. There are not as many templates as other platforms, but they do have industry specific ones, which helps you quickly start your page. One cool feature is that you can sort templates by conversion rate. While there is no hard and fast rule that says you’ll match the same numbers, you at least get some sense of perspective in choosing your template. Pricing: Pro costs $49/month when billed annually. It comes with unlimited landing pages and live chat support. Unbounce’s sweet spot is really marketing agencies, where marketing professionals use Unbounce’s resources across their clients. Though they remain a compelling option for any company that values landing pages, they are not geared towards startups; for example, the the free form page editor can be a little tricky to use, especially if you are a novice. Additionally, Unbounce has many filters, with 9 campaign types, 11 industries and 3 special features. Overall, Unbounce has seemingly infinite extraneous customizations and choices around every corner including 9 campaign types, 11 industries, and 3 special features. All of this is both a blessing and a curse depending on level of experience of the marketer and how well-defined your campaign is. Pricing: Starter begins at $49/month with 5,000 unique visitors, and pro is $99/month with 25,000 unique visitors. There are even bigger plans going up to 500,000 unique visitors. Advice for the Early Stage Startup: Just. Medium.